It’s an unfortunate truth that as we get older, our stability and coordination faculties begin to falter. It comes as little surprise, then, that one of the biggest causes of anxiety for older adults – especially those who live alone – is falling or tripping when going about daily activities in the home. 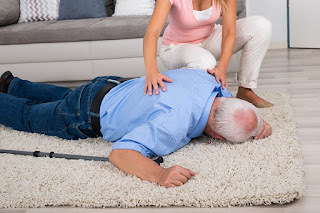 Fall-related injuries account for the biggest portion of the injuries that older patients present with in the emergency room, so it pays to know how to reduce risks of falls in seniors, both for the affected demographic and their families. The following safety tips for fall prevention are a great place to start. Whether the older person lives in a retirement village or in their own home, it’s paramount to make the living space amenable to safe walking. This means everything from cleaning up hazards on the ground-level – grandkid’s toys that are lying around, low coffee tables in awkward places, rugs that are easy to trip over – to installing rails in tricky places like the bathroom and stairs. Consider adding cabinets to the wall to create more floor space to safely maneuver around the house. Slippery soles are a major risk when the walker is already unsteady on their feet. If you’re older and wear shoes in your home, ensure that they have enough grip to keep you firmly grounded on carpet and linoleum surfaces, and outside in the garden, opt for deeply-grooved gumboots to ward against the dangers of mud and slippery grass. The same goes for walking on footpaths or around town; many of the Skechers-like casual shoes on the market make the grip a top priority when catering for the older demographic, so there’s sure to be no shortage of options. Some medications and diagnosed (or undiagnosed) health conditions can increase the likelihood of falling, due to their detrimental effect on balance, alertness, and muscle strength. Selected sedatives used to treat depression, for example, may be doing an older person’s physical fitness more harm than good. It may be as easy to solve as readjusting the time at which you take the pills, or your general practitioner might prescribe you a drug that interferes less with your mobility skills – but whatever the outcome, it’s important to stay on top of your health with the experts’ help. It can be difficult admitting that you’re not as mobile as you used to be, but it’s an integral thing to accept so that you can alter your movement style and behavior as your risk of falling increases. Try not to rush around your day, and if you’re finding yourself feeling a bit tired before making your way up or down the stairs, or on or off the toilet, then take a moment to rest before making those transitional movements. In some cases, an increased tendency to fall can be traced back to failing eyesight, a problem that can be treated with a simple trip to the optometrist. The issue might also be caused by bifocal lenses, which have been known to cause balance trouble on stairs, so getting an expert to assess the individual’s eyesight at least every year is a sensible idea. Additionally, check that important areas of the home are well-lit – dim lighting can do as much harm as a dodgy glasses prescription. Though it may sound counterintuitive, the best way to prevent failing mobility is to move more. Getting used to the altered way that your body works as you age will allow you the best chance of moving around without injury – so, if you’re able, recruit a few friends for a walking group and see how much better you feel. Plumbing Plus is one of Australasia’s leading retailers of plumbing and bathroom supplies, offering an extensive range of products. Browse their collection in one of their stores across New Zealand, or shop online at their website. “Falls Prevention Facts,” National Council on Aging. “Prevent Falls and Fractures,” National Institute on Aging.